160,000 utility customers were in the dark after Wednesday's vicious nor'easter dropped up to two feet of snow in some towns in western Connecticut. 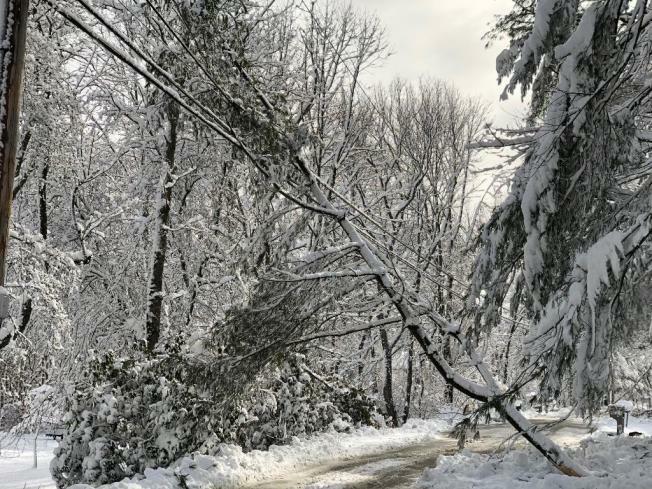 The heavy, wet nature of the snow did the most damage with trees snapping and power lines coming down all over southern and eastern Connecticut. The storm's snowfall distribution was a typical one for a nor'easter with two bands of very heavy snow. One band was located far to the west from New Jersey through Danbury and north into the Berkshires and southern Green Mountains (where nearly 40" of snow fell in one town). A second maxima was located farther east from Portland, Maine south through central Connecticut and into Long Island. The band to the west was primarily driven by what we call "frontogenesis". Effectively a front was forming high in the atmosphere (nearly 15,000 feet above our heads) and a localized area of intense lift resulted in a heavy band of snowfall that effectively rotted in place for hours and hours. In this band snowfall crystals grew with great efficiency and the snow that did accumulate was quite fluffy! Warren picked up 25.5" of snow in 24 hours with a liquid equivalent of 1.56" making this a 16:1 ratio of snow:liquid. To put that in perspective the 10.8" of snow in West Hartford I measured had a ratio of 9:1. We can visualize this by looking at this cross section produced by SUNY Albany grad student Tomer Burg showing the band of lift in the atmosphere (look where the arrows point upward) starting low in the atmosphere in eastern Connecticut and winding up much higher up over western Connecticut and New York. 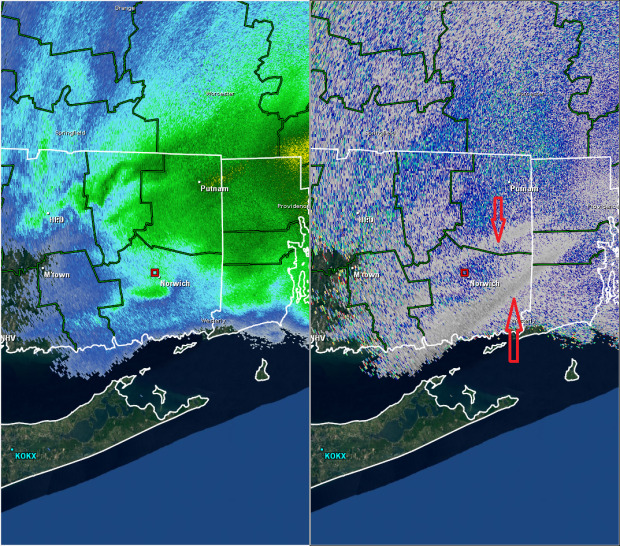 The band over western Connecticut was the most persistent and the snowflakes that were growing (rapidly, and efficiently) were dendrites that piled up quickly. Another interesting thing you can see in both the cross section and the snowfall analysis is the local minima in snowfall between the two bands. A combination of sinking air and warmer air in the valley lead to relatively lighter snowfall amounts in the northern Connecticut River valley (8.7" at Bradley Airport). Believe it or not we can see the rapidly growing dendrites on dual polarization radar. The big dendrites that formed in the western band (that accumulated very readily) fall flat as they float to the ground. When the horizontal radar beam hits the snow flakes (that are oriented horizontally) and encounters a very large number of flakes the radar's beam slows down. The horizontal beam is now slower than the vertical radar beam and this results in an increase in Specific Differential Phase (known as KDP). We can see these large number of dendrites clearly on radar with a spike in KDP about 10,000 feet above the ground. The signature appeared periodically across the state but lasted for hours over the hills indicating snow flakes were growing rapidly and with great efficiency in the western band. 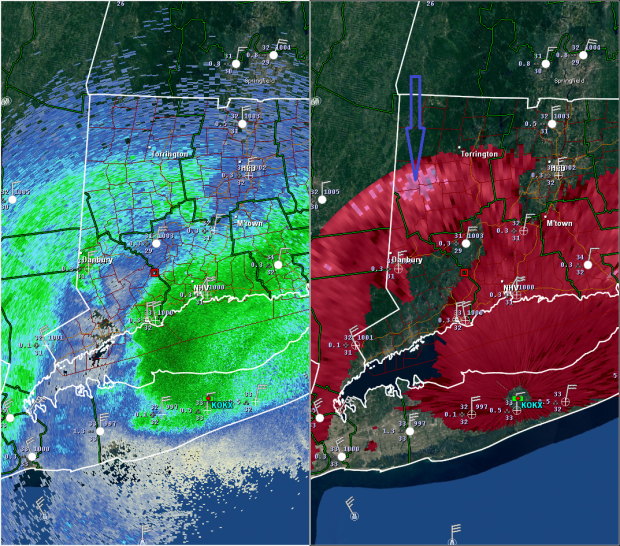 Radar also picked up something we typically see in our strongest nor'easters. Thunder and lightning was common across the state yesterday evening with great displays of vivid lighting and booming thunder. As the electrical field grows in clouds the ice crystals tend to align with the electric field. As the radar beams (horizontal and vertical in dual pol radar) encounter these canted ice crystals the forward propagating radar beam begins to lose its orthogonal polarity - for instance the horizontal radar beam becomes more vertical. This produces a radar artifact down radial and you see streaks of either high or low ZDR known as depolarization streaks. This signature frequently precedes thundersnow as the electric field of the clouds eventually discharges in a lightning strike. 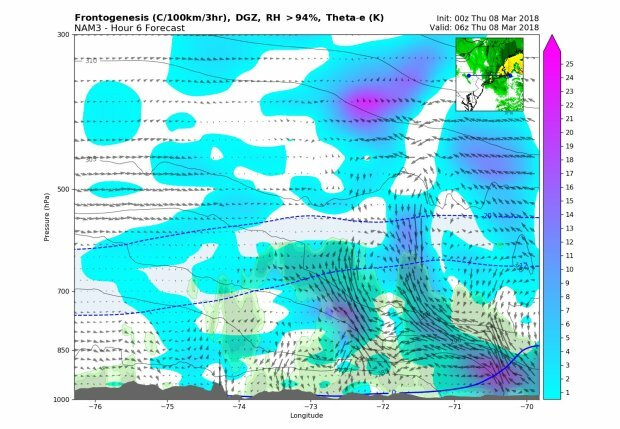 We had been forecasting thundersnow for 2 days as there was a very robust signature on our computer modeling for an area of instability in the atmosphere. You can see in this weather balloon launch on Long Island what we call a MAUL or Moist Absolutely Unstable Layer which is the instability necessary to develop a thunderstorm. You can identify this feature by looking for an area where the temperature rapidly decreases with height (in this case a sudden jerk to the left when reading the diagram from bottom to top). In this sounding you can see it near 700mb where there is a sharp decrease in temperature which creates an absolutely unstable layer and favored thunderstorm development. Of course, temperatures near the ground played a big role in how much snow accumulated. In the valley locations snow was initially slow to accumulate and in the hills where it was colder the snow accumulated more rapidly. There was certainly an increase in snow totals on hill tops than in valleys. Take New Milford, for instance, where 10" of snow fell downtown but 18" fell in the hills of town! Where temperatures were warmest - and where nearly a foot of snow fell - in towns like Guilford, Madison, Branford, Killingworth, Essex, and Deep River the tree damage was extensive. The outage map from Eversource illustrates this quite well. With 2 feet of snow in Warren there were few issues (snow was dry and fluffy) but the paste on the shoreline took down trees and power lines all over the place.